Hey! I got our September update done while there’s still one whole day of September left! Sweet, sweeet Victory! Now go enjoy the photos! 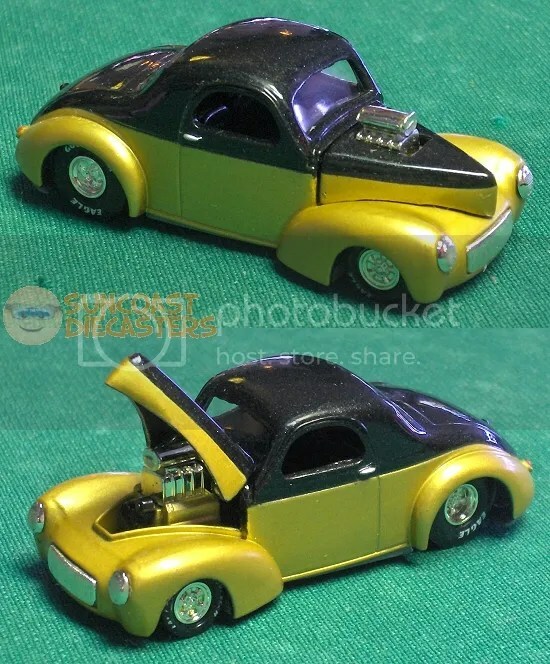 We start off our September update with Original Ken’s Most Favoritest Thing in the Word: a Willys model. He purchased it from Big Tractor Mike. 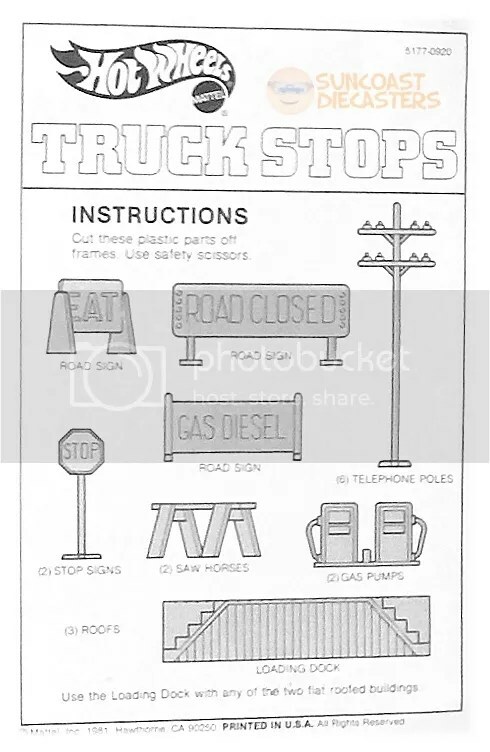 …Most favorite, except for garbage trucks, that is. 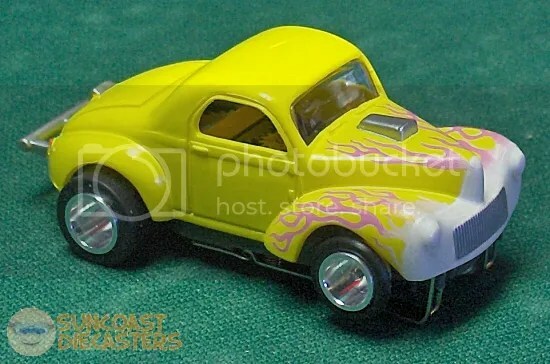 This nicely-sculpted model with its white-to-pink washed flames and bright yellow– Hold it… What the heck is going on under the front end of this thing? Is it buck-toothed? Are those fangs?!? 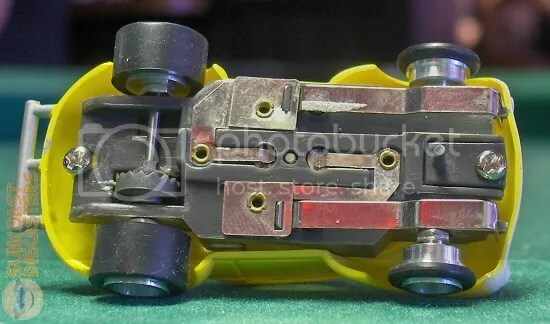 Okay, I’ll let you in on the secret: It’s a slot car. Which is Ken’s other, other favorite thing. 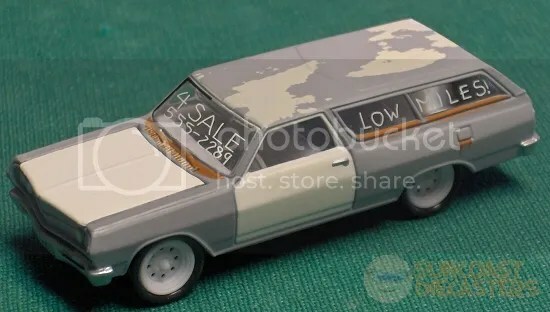 BTM explains that this slot car is an Autoworld model. 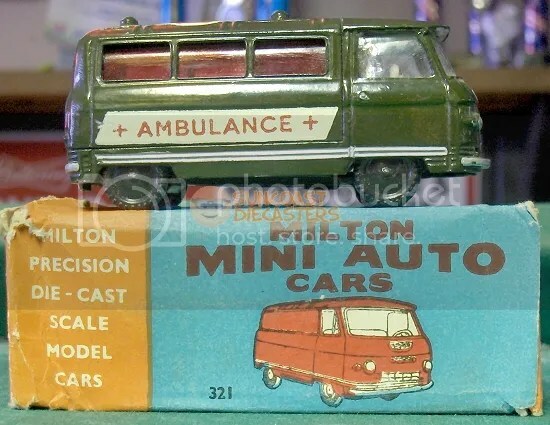 But, not the old Autoworld, rather the modern one. 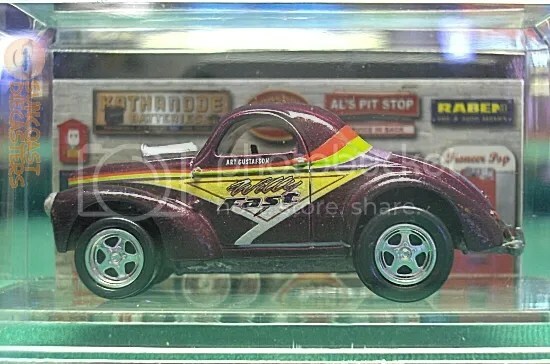 Yet, Ken says it’s an HO Johnny Lightning, Thunderjet series, which was previously known as Aurora and/or Cigar Box. So, which is it? Turns out it’s both. 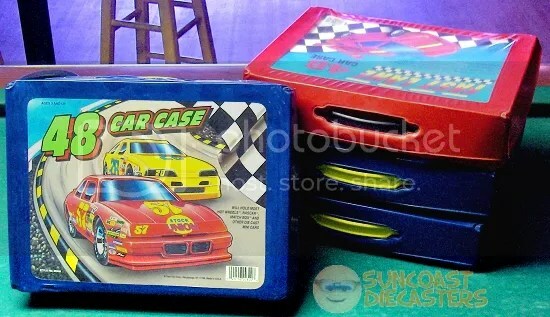 The Internet was actually useful this one time, in providing this well-written article which explains that, long before the ‘Net, Autoworld was a mail-order catalog supplying the slot car market. AW closed eventually, but was re-opened by Playing Mantis. The new AW re-issued new productions of the old models. Because everything old is new again. 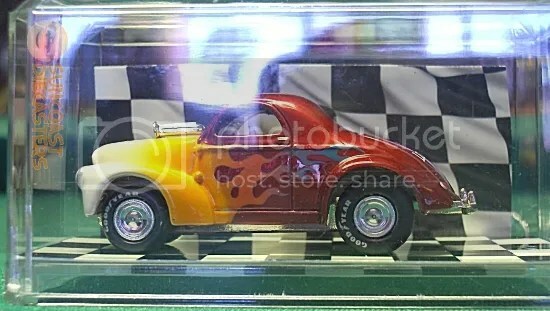 O’Ken also bought these Willys models from BTM. 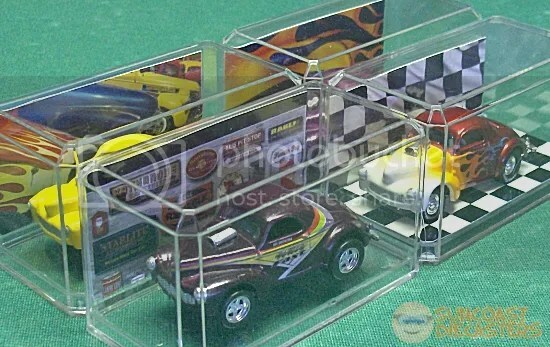 All four are Johnny Lightning; the display cases are from a Lexmark promo. Ken put in his own background cards. Here, you can see how simple geometric alignment can make for an attractive display. 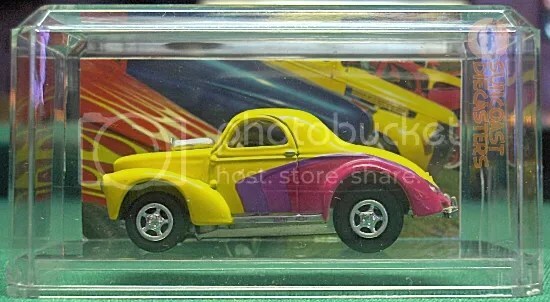 Creative background cards may create the illusion of a showroom, raceway or other diorama-like appearance. 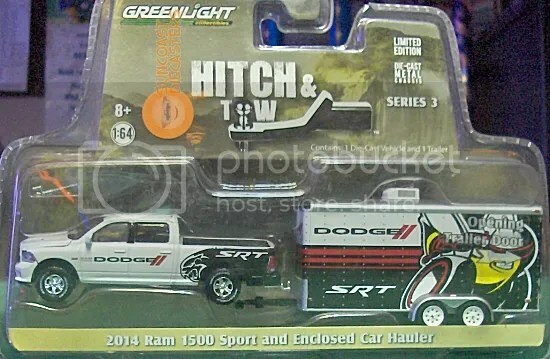 Tom bought this Greenlight “Hitch & Tow”-series from Big Tractor Mike. 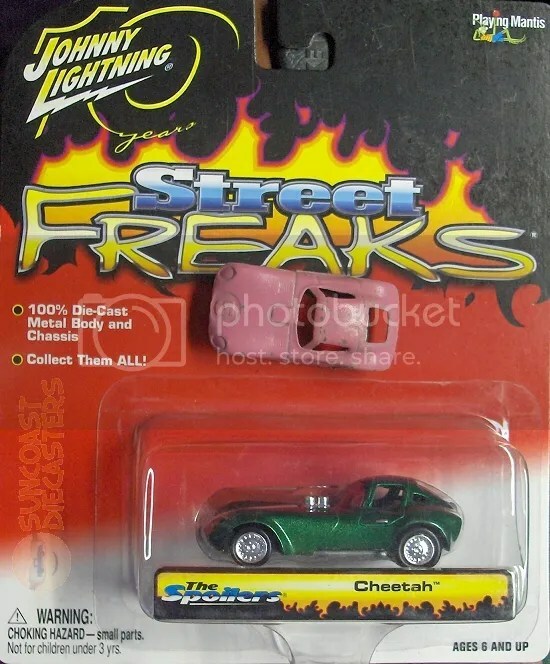 From BTM, Big Rob bought this sweet custom Johnny Lightning Cheetah, as well as this classic TootsieToy Cheetah. And now, because you’re “good people”, here is a better view of the two vehicles. C’mon, you didn’t think I’d cheetyah out of a nice close-up, did you? See what I did there? ”Cheetah”, ”cheetyah”? This is good stuff! Note: Please follow all instructions carefully. Remember to run safely with safety scissors. So what’s with the paper guidance? Well, it goes along with this here fellow here. This is the Peterbilt Hauler. 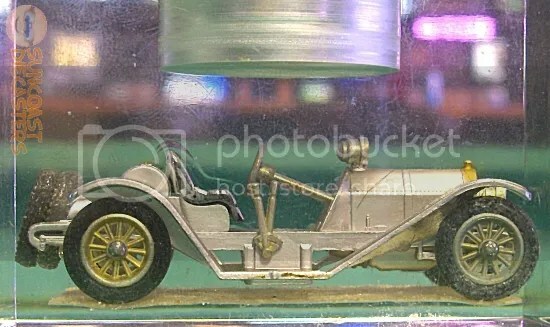 More specifically, this is from the Steering Rigs series. Can you see that large, clear plastic steering wheel on the back of the trailer? No, you can’t, not in this shot. Anyway, that was connected by a linkage to the tractor, thus allowing the child (or Bill) to “steer” the toy. And yes, I am totally regretting not photographing the loose, unbagged one. 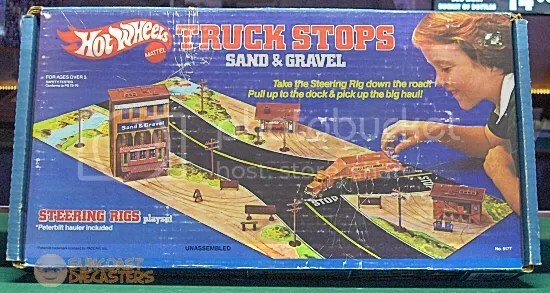 Per Big Tractor Mike, only two Steering Rigs sets were produced: An oil refinery, and this Sand & Gravel set, which was purchased from him by Terri and Robert. This set is complete, and its inner bags of this set are all sealed, making this a doubly very rare find. Heck, the previous owner hadn’t even colored it in! 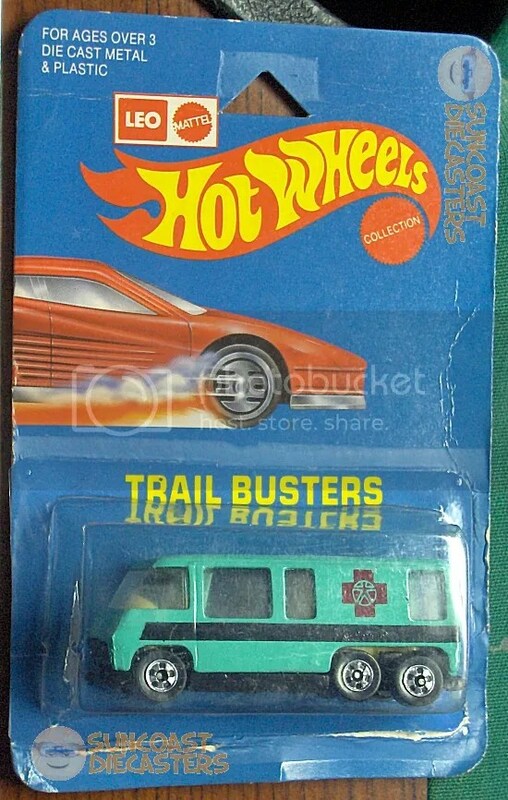 Ah, the natural, unspoiled beauty of a Hot Wheels set in the wild. Mike engages the wild Set while I stay safe up here in the helicopter. 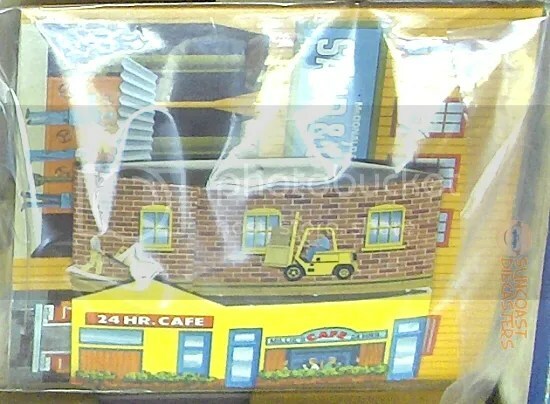 Classic Mattel: Soft paperboard buildings topped by hard plastic roofs. 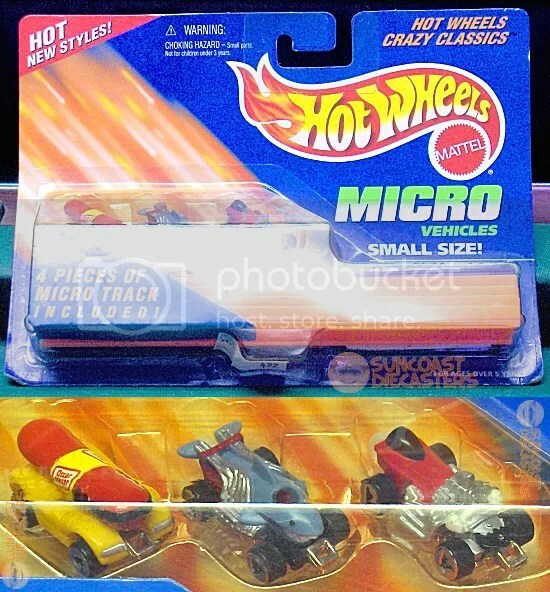 For its completeness, great condition, wonderful conceptual playability, and absolute rarity, I very happily declare this Hot Wheels Steering Rigs playset to be Suncoast Diecasters‘ Find of the Month(*) for September 2016! ‘Tis a rare thing of beauty. See you at the October meeting! Big Tractor Mike hauls in nearly a whole movie set’s worth of goodies with this bunch of Kenner Aliens toys he bought from me. Starting with this awesome Power Loader, which Ripley (Sigourney Weaver) used to battle the Alien Queen. What I like about this toy is how, at only about 10” tall, it nonetheless gives one a sense of mechanical massiveness. Not to mention the fact that the pincers actually work (via push-buttons atop the shoulders). Dexter used this to play dodgeball. Now, as you drink in the image of the Power Loader, you may eventually notice several design inaccuracies, not the least of which are the (non-working) treads which somehow have replaced the machine’s ambulatory legs as seen in the movie. However, Kenner makes up for this by offering an astoundingly realistic sculpt of Ripley (he typed mockingly). That is *definitely* Sigourney Weaver. Or Audrey Hepburn. Or Bjork. Next is this disturbingly accurate playset of the Alien Queen with giant ovipositor. Just like in the movie, the Queen can be detached from the nest to rumble with Ripley. And, just like not at all in the movie at all, glow-in-the-dark slime was included to pour into the top of the eggarator, which would then drip onto whichever action figure was standing or lying in the pit beneath the goopositor’s, uh … faucet? Yes, I know, you’re clamoring for a nice, creepy Queen cuddle. Here ya go. Don’t e-mail me later about your nightmares. Occasionally there are controversies when toys are seen as depicting frightening or disturbing concepts. (In)famous ones include the Al Snow figure with “Head” accessory, and the talking Venom figure which said (among other phrases) “I want to eat your brain!”. No such concern with the Alien Queen playset! There’s nothing here that could possibly upset small childr — — Oh, gack … That’s disgusting…. Anyways, BTM also got this Alien Warrior with seethroughishable carapace, along with Hicks with super-duper Space Marines rifle blaster gun. 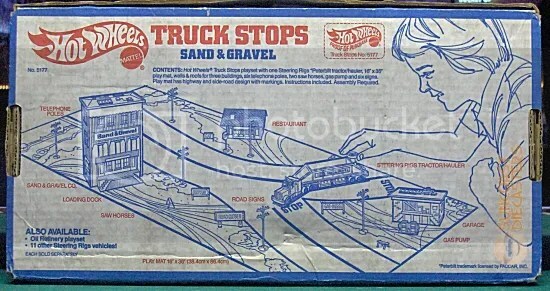 Someone at Kenner very thoughtfully made the interior of the pit removable for easy cleaning. Other accessories include a flexible facehugger, the missile for the Power Loader (see, it wasn’t missing), Ripley’s flamethrower, and an Alien Queen spawn. The brownish thing which looks like someone tried to carve an Alien out of a Tootsie Roll is the spawn accessory that “launches”, facehugger-like, from a gimmicked egg on the playset base. Kids! Start your own ”Aliens” franchise at home! I’m fairly certain the darker spawn item is supposed to be a Queen. If you look at its head, you can see ridges which to me suggest the crest of the Queen’s adult skull structure. Wave your queens in the air like you just don’t care! Rrrmf hrrmf mrrmf frrmf hrrmf. Mrrmf. 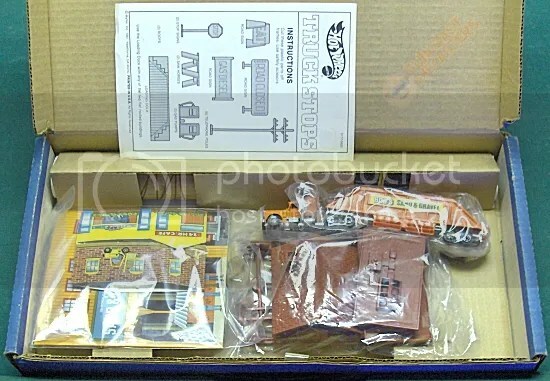 BTM also bought from me this 75th Anniversary Publix tractor/trailer set. 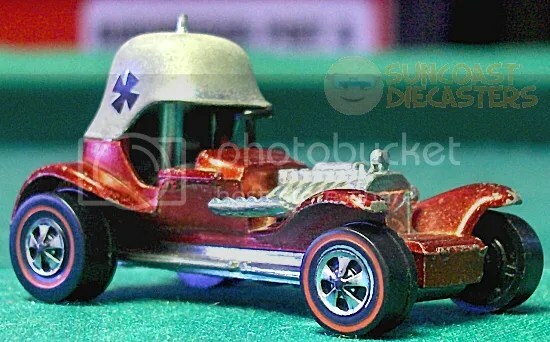 Started in 1930, Publix’s 75th year was 2005, thus making this toy now ten years old. So, will BTM bust it loose for play and display, or will he keep it sealed on its card for further collector valuation? I do not know. And we keep our pleasure in the southeasternmost states where it belongs. Somewhat ironically, Big Tractor Mike not only collects big tractors but also teensy little vehicles as well. Such an example is this very cool Lunar Landing Collection, courtesy Your Humble Webmaster. 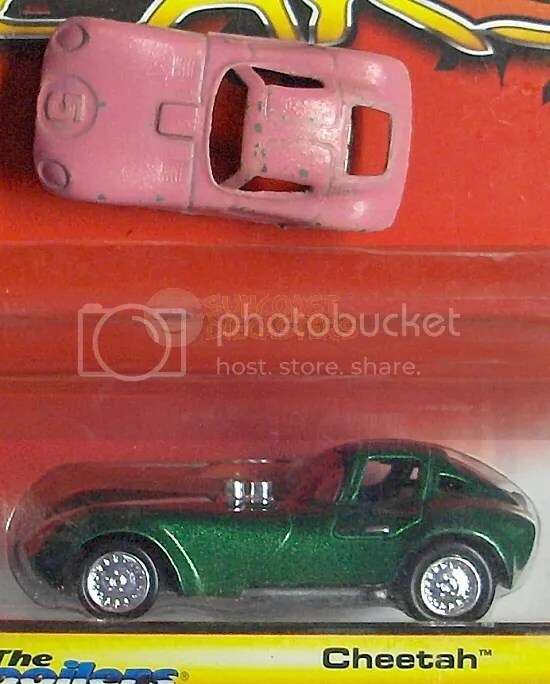 Personally, I’ve always found most Micro Machines models to be slightly cartoonish in their proportions. 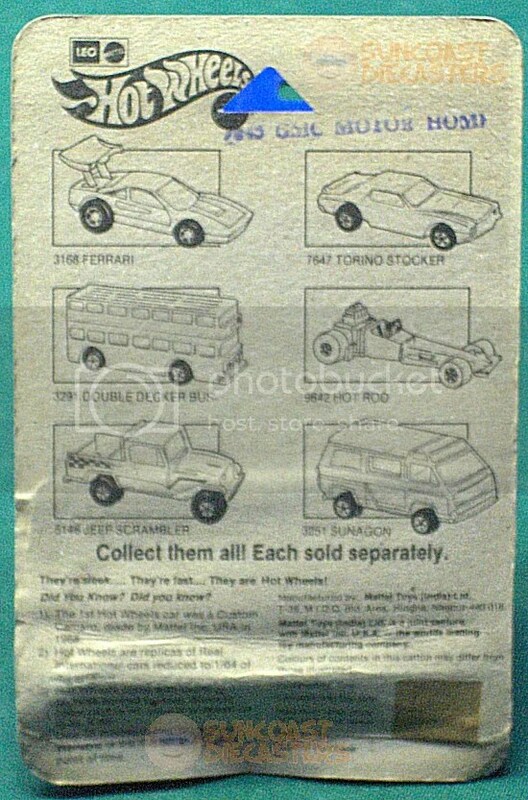 In contrast, the vehicles in this set seem much more accurately scaled. See for yourself. 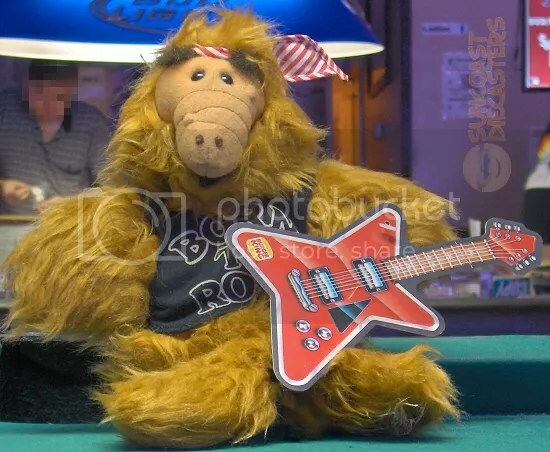 How could the moon landing be a hoax when it has given us such cool toys? Honorable BTM-san also relieved me of the burden of this kool kaiju kollection. Methinks I got it at a Star Trek konven- er, convention, due to its kanji/kana text. Yes, the box is dented, but that’s okay, because so is BTM. 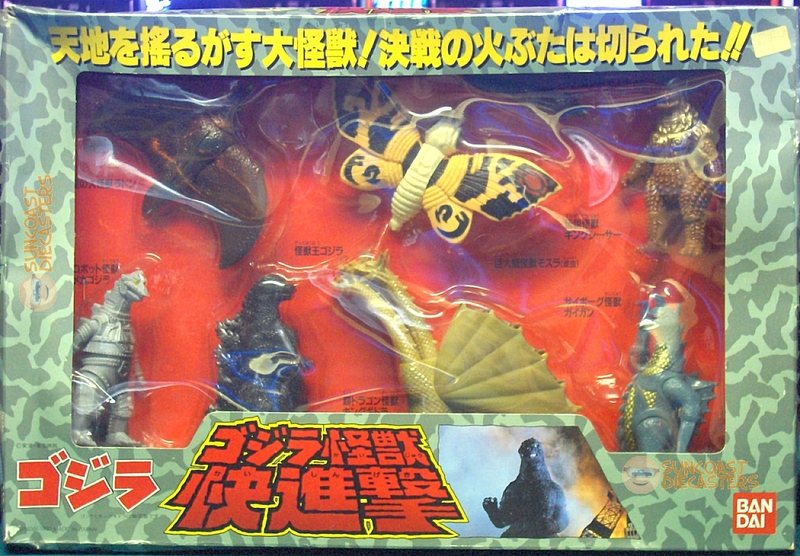 Starting at lower left and going clockwise, the figures are: MechaGodzilla; Rodan; Mothra; King Caesar; Gigan; King Ghidorah; and Godzilla himself. Little baby larva Mothra is effectively invisible in the glare and shadow bewixt Mothra and Caesar. See for yourself. Click link below for Best. Godzilla. Movie. Ever. 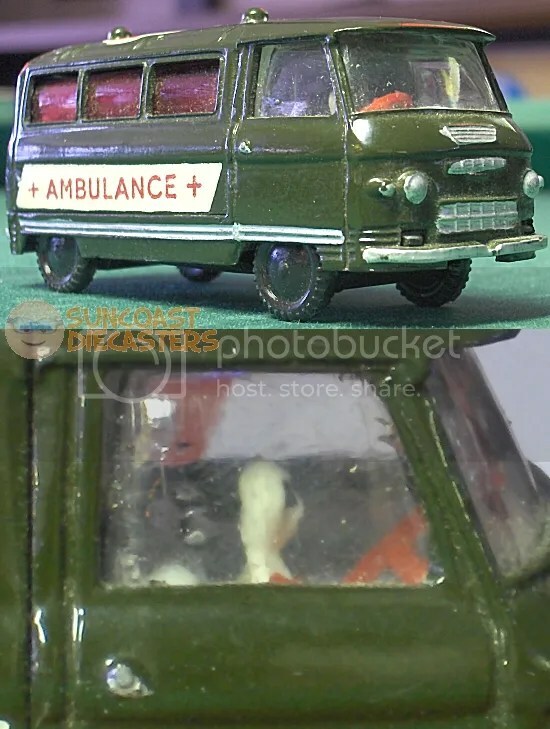 Tom deftly defends his position as Suncoast Diecasters‘ Viscount of VWs with the following purchases. 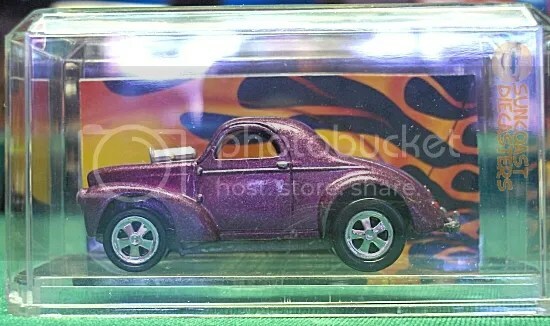 The”L’il BUGger” is a custom repaint by Jim. Having been stationed in Germany, I can tell you that Polizei is in fact the German word for Police. So, what’s the German word for Volkswagen? Another repaint by Jim. The “Flower Power” van spreads love and harmony with songs of the brotherhood of man and thoughts of communing with Nature and, you know, other crap like that. ”Those were the days, my friend/We thought they’d never end/” — Fortunately they did end, and we’re all better off for it. Oh, for crying out loud. Anyway, in this next photo, Tom is all about branding. I’m not sure what brand, however, or what make or model or product line or … Well, look, let’s all just enjoy the branding! Well, looky here! 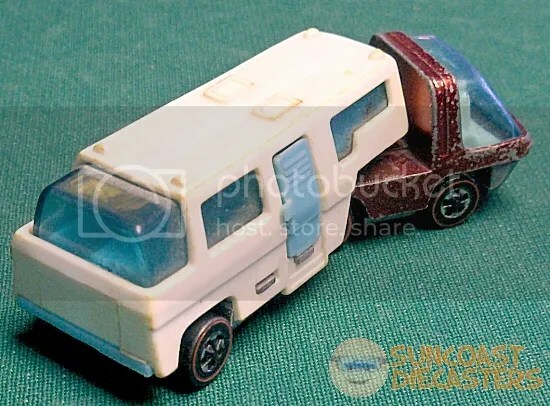 There’s a cute little figurine of the Michelin Man atop the van! How adorable! …By the way, did you know that the Michelin Man’s real name is Bibendum? Opening doors!?! Truly, it must be ”The Toy of Tomorrow”! If you cross your eyes, the photo is in 2-D. Towards the end of the meeting, Ken and I were trying to figure something out on my laptop. It took longer than I’d wanted, thus I didn’t have time to photograph his treasures, so I told him to just shoot his own and e-mail ’em to me when he got the chance. 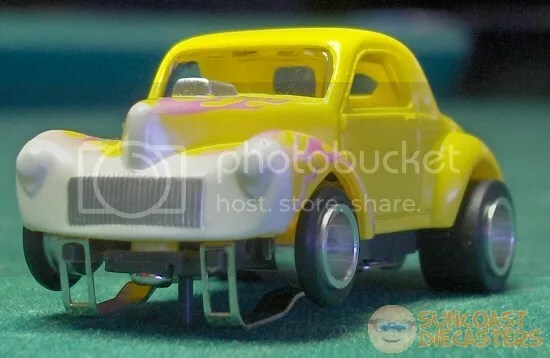 Later that day at home, Ken was apparently rolling around on the carpet like a child, playing with his toy cars, when suddenly he remembered that he owed me some photos. That, I guess, is the explanation for these two pics. I’ve been carded! Heh. Okay, so why do I have this card which seems to be wrapped in plastic (which it is, by the way)? Because it’s underneath the super-neato thing with which Big Tractor Mike RAOK’d me at the end of the March meeting. Additional by the way: You can no longer “join the club!”. Playing Mantis disappeared into RC2, which later became Learning Curve Inc., and then was absorbed into Takara Tomy. ‘Tis no more, me lads! Get it? Johnny Lightning, taking the country by storm? ”Lightning”? ”Storm”? GET IT??? Just … LOOK … at that detail! Why, it’s the special, limited “Club Member” edition Custom Toronado! Now here I face a challenge: to free, or not to free? Like the Publix truck above, this has been in its original, sealed container for quite some time – nineteen years, to be exact! It seems that the longer a collectible stays in its original package, the longer one has to let it stay in its original package, so as to allow the item’s collector value to increase. I’d readily bust it loose, but after nearly two decades, it that wise? Well, that’s my burden, not yours. 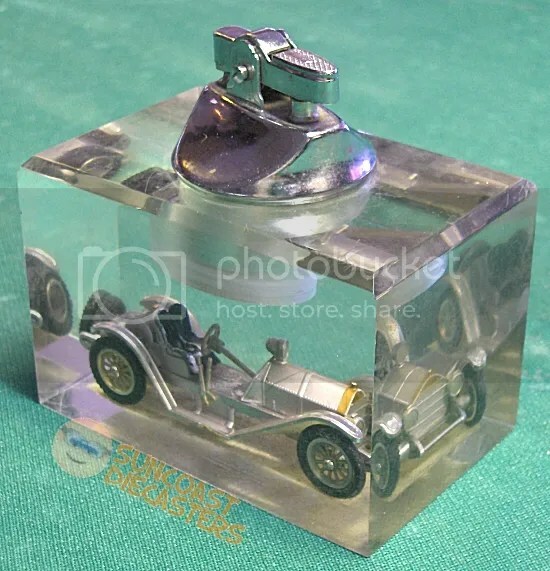 You may simply drink in the fact that this item is our Suncoast Diecasters Find of the Month(*) for March 2015! ”Lightning storm”! Don’tcha get it? ?